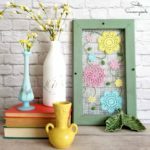 Several years ago, before I even started my blog, I created some Spring home decor inside pickle jars / vintage jars with little Spring garden and Easter scenes. I just thought they were the cutest things ever- y’all know I love miniature ANYTHING! And when I reposted the old photo on my Facebook page, the positive response was overwhelming- so, here we are, with a long overdue project post. 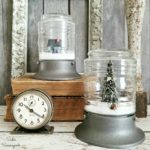 These were the original Spring home decor jars- albeit, this a better photo than the one I originally posted! But, nonetheless- these are the original jars that prompted this post. See what I mean? Just adorable…and quick/easy to make once you have all the components. Who says “snow globes” need to be for Christmas or winter? I think creating little spring garden scenes inside glass jars with lids is exceptionally darling Spring home decor. This post contains affiliate links for your crafting convenience. Surprisingly, though, I didn’t have any vintage jars or pickle jars in my stash- how did that happen? So I headed to a favorite local antiques shop to re-stock…and specifically looked for wide mouth jars. And this peanut butter jar, complete with a Spring-y yellow top, was ideal! The vision I had in my mind for involved a little potting table. So I assembled a variety of dollhouse miniatures and crafting supplies- some of which I already had from previous projects (like the popsicle sticks). But I had to shop for the miniature dollhouse gardening darlings– I know, poor me. To create my potting table, I simply used plain popsicle sticks which I cut to size and then hot glued together into a basic table shape. Oh, and I cut out a circle of green fabric that fit perfectly in the bottom of my jar. Then I just needed to bring my potting table and Spring garden scene to life! To make everything easier- I hot glued it all! Table to fabric…pots to table…and so on. Other than the stacked pot inside the bottom one, all my little dollhouse miniatures were attached with glue. For my second Spring garden scene inside, I used one of my larger vintage jars. I desperately wanted to use some vintage miniature red and white toadstools from my stash (similar to these)! First, I created a layer of reindeer moss glued to the same green fabric, and cut to fit inside the bottom of the jar. To the reindeer moss, I added the little toadstools (with hot glue again), as well as a pail of mushrooms (the pail was one of my dollhouse miniatures). And here is the vintage jar with the smattering of toadstools! With my pickle jars / vintage jars all put together, I have some wonderful Spring home decor. And just think, you can have a sweet little garden (in a jar) without getting dirt under your nails. 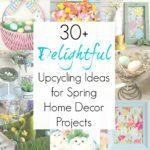 And if you’re looking for more upcycled / repurposed Spring home decor projects, please check out my full collection here for even more inspiration! I love your little potting table scene!! Cuteness overload (I think it was the kitty that did it, lol). So cute! I love the mushroom jar…I can just see the gnome gardener working in his mushroom plot! Adorable. I love little scenes you created in the various jars. Thank you so much for sharing your Spring scenes with us at Vintage Charm. I am featuring your Spring jars at Snickerdoodle tomorrow. OMG!!!! How cute they are!! I want to do some of these with my grandchildren. I think they will have fun creating their own jar scene. Love your creativity and that you share your ideas! Cottonball and jars are adorable! You are so creative. Thank you very much, Veronica!! Hello Sadie. 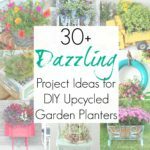 These are such brilliant ideas, I just love them! I shared it on facebook before I even commented. I may have some miniatures to make a few myself, if not I am going to get some! I am debating between the fabulous garden table set up and the set up with the pitch fork. They are all adorable especially with Cottonball in the picture! Have a great day! Very cute idea! Poor Cottonball…She IS a great accessory, though. Already linked up!! Thank you so much, Karren. Love your sweet Spring gardening jars! You’ve inspired me to make some myself for the kitchen table. LOVE Cottonball even more!! Perfectly adorable model for showing your jars. Give her a hug and kiss for me, eh? Me again! Tell Cottonball I apologize for using the wrong pronoun! I meant to say: HE. Also do reassure him he is STILL the SWEETEST thing in the house! Oh my, I love these really cute creations of yours. Thanks for sharing them. I adore everyone of them. Aren’t these cute? Love the Easter jars. These are absolutely darling jars. Such a fun activity – esp. for kids! Thank you, Maritza! And YES, this would be perfect for kids! What a cute little garden bench – Thanks for sharing on the Pleasures of the NW’s DIY Party! Thank you for hosting, Helen! These are so cute! I love miniature things! Very sweet idea and so creative. Love the sweet miniatures. Thanks for sharing this fun post at DI&DI. I sure did- thank you so much! Oh my goodness!! How adorable! I never thought of using these little fairy garden pieces in this way, these are just perfect! Thanks so much for sharing at Celebrate Your Story! Omg, I love anything tiny and adorable, and these are the best!!! I also happen to have those little mushrooms and moss left over from our wedding decor…I need to make one of these mini scenes! 😀 Very, very cute and creative post. These would be so adorable on a tablescape! 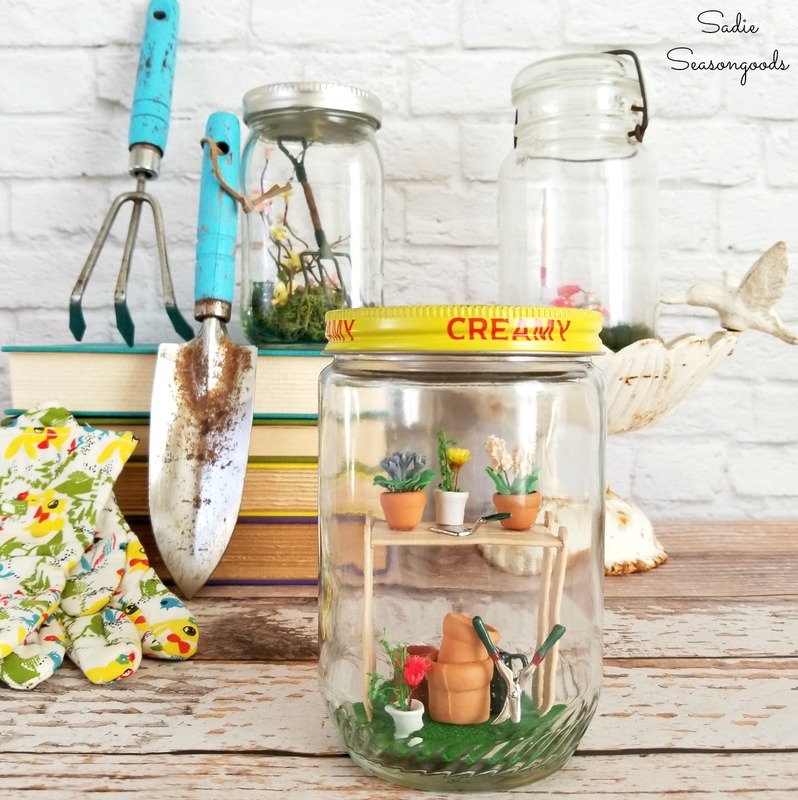 Thank you for sharing your DIY Spring Jars at the Snickerdoodle Create~Bake~Make link party! I am featuring them tomorrow at Snickerdoodle. Thank you, Sharon- as always! Love these! SO creative and fun! These are adorable. I think they would make the perfect little gift to an office cubicle buddy or to a friend in the hospital. They are cheerful and would help bring at least the idea of the outdoors in. They definitely would make adorable gifts- thank you so much! Hi, Susan- thank you so much! I don’t do printables, so I’m afraid it wasn’t on my blog!! I’m sorry. But I sure enjoy all that you do. Keep up the great work. Awesome! I love these Spring jars you have created – extremely beautiful and creative. I especially liked the one with the Spring gardening scene. Hi, I didn’t know you were a mini fan! My dollhouse projects give me such great pleasure but NOW take up a lot of room…it’s another addiction in my book! I am on the lookout for pretty (albeit cheap) vintage jars for more waterless snowglobes! Made several this week and am pleased with them.